Glasgow Print Studio is pleased to present New Etchings & Monotypes, an exhibition of new prints by Ken Currie, on public view for the very first time. Currie’s association with GPS goes back a long time, to the early 80s. However it was only in 1992 that he undertook any serious printmaking work at the print studio, when he produced a series of 27 etchings called The Age of Uncertainty. This was exhibited at GPS that same year. The current exhibition of new etchings and monotypes will be Currie’s first at GPS since that time (a period of 23 years). It will also be the first time that he has shown any new work in Glasgow (Currie’s hometown) for over 13 years. This new body of work has been produced over the last 8 months, with the etchings and some of the monotypes being produced at GPS over the last 5 months. Etching as a medium has always suited Currie’s aesthetic concerns and themes which could broadly be described as both tenebrist  and chthonic - working with strong contrasts between light and dark both technically and, philosophically. “I am attracted to the possibilities, in both etching and monotype, of contrasting luminous whites with deep velvety blacks to create strong images." Etching is very much about technique and process and has many similarities with painting. However, getting an etching plate to deliver the image you want can be hugely challenging. The artist often has no idea how the plate will turn out. As a medium it is entirely contingent and control of the final image can only come with vast experience. So, if these new etchings are about anything they are about the struggle simply to take a visual idea and make it work as a print. tenebrism - “a style of painting…characterised by predominantly dark tones and shadows with dramatically contrasting effects of light”. chthonic - “relating to or inhabiting the underworld”. Image: Top: Ken Currie, 'Transformer', image size 30 x 42 cm, paper size 53 x 44 cm, etching in an edition of 40. 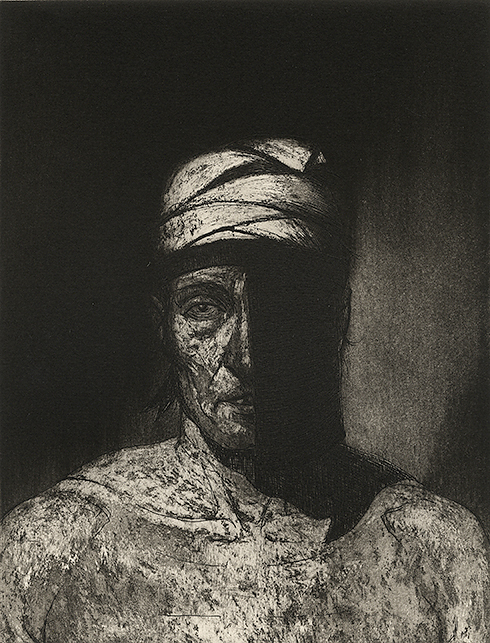 Below: Ken Currie, 'Thomas Muir at Chantily', Image size 21.5 x 16.5 cm, paper size 42 x 34.5 cm, etching in an edition of 40.